This weeks vegetable is Parsnips! The parsnip is a root vegetable that is closely related to the carrot and parsley. The root is a cream colour skin, and it becomes sweeter in flavor after a winter frost. Interestingly enough, in sunlight, handling the stems and foliage can cause a skin rash in some people, so make sure you wear your gardening gloves! 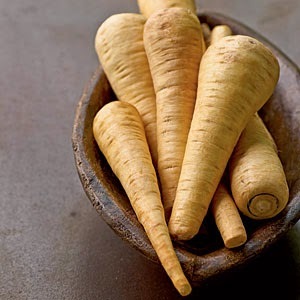 Unfortunately, parsnips contain more sugar than carrots, radishes, and turnips. However, it only contains 75 calories per 100g. Parsnips are sweet and juicy and rich in many health-benefiting phytonutrients, vitamins, minerals, and fibre. Parsnips are an excellent source of dietary fibre, containing 13% of your daily fibre intake in only 100g! This reduces cholesterol levels, as well as can reduce the risk of obesity. Parsnips contain many antioxidants, and these compounds have anti-inflammatory, anti-fungal, and anti-cancer benefits. Parsnips also contain vitamin C, folic acid, vitamin B6, vitamin K, and vitamin E.
For this week’s recipe, we have chosen to share with you parsnip fries, with horseradish rosemary mayo. 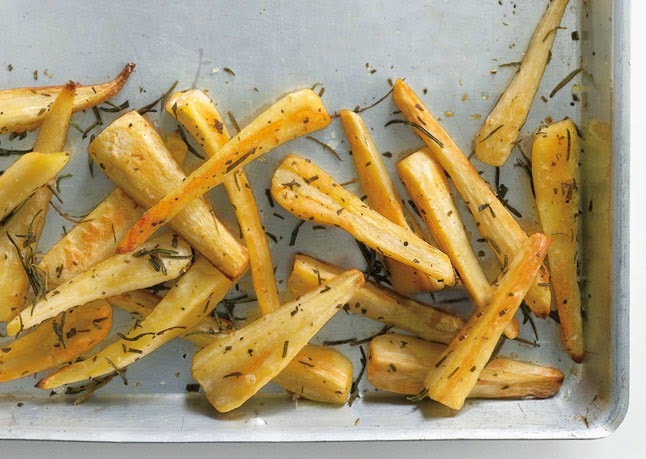 In a bowl, sprinkle the parsnips with the olive oil, salt, pepper, and rosemary and toss gently. Bake the parsnips on one side for 15 minutes, remove from oven, and flip over and bake for another 10-15 minutes. While the parsnips are baking, you can prepare the horseradish mayo buy mixing all of the ingredients together.